This stunning cake was created using five wheels of cheese and it would be the perfect “cake” for a reception where there was also a dessert buffet. Or maybe you aren’t a fan of sweets and you’d rather let your guests eat cheese with fancy crackers and marmalade. Which is totally acceptable of course. The other thing I really love about this cheese cake is that it is adorned with gorgeous fresh flowers. That really gives it that “wedding cake” look. And if you aren’t a fan of roses this cake would be amazing with sunflowers! 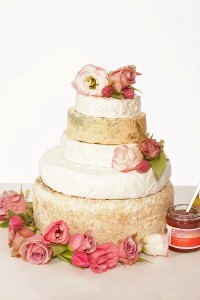 You can find this cheese wedding cake here.